Earlier this week, I talked about my haul of exciting spring pieces from Necessary Clothing, so let the styling begin! 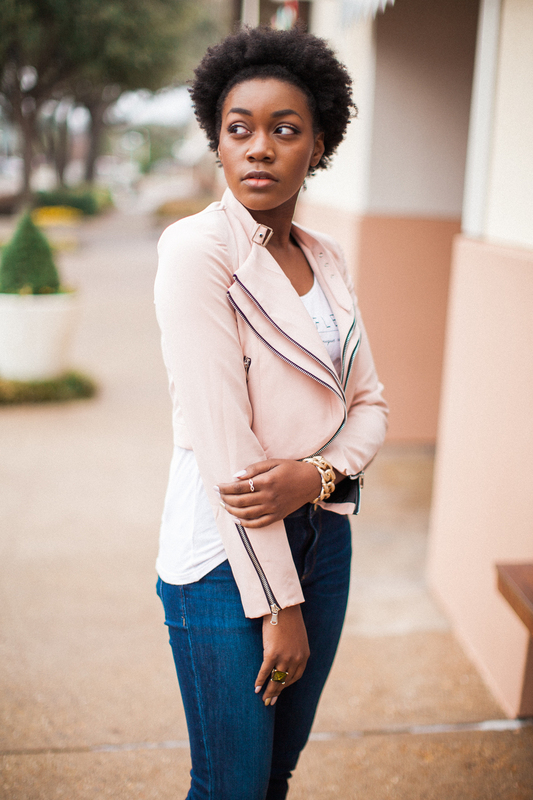 Out of all of the pieces I ordered, I was probably the most excited about styling this pastel pink double-zip moto blazer. I'm obsessed with rocking pastels as somewhat neutrals this season and I love an edgy piece that I can add to a feminine look. This week's shoot took place at The Plaza at Preston Center which has some of the cutest boutiques and eateries! I'm posing in front of Sprinkles which has delicious cupcakes -- I may or may not have eaten one (or two) for breakfast. I mean, cupcakes are basically muffins with icing, right? !